What is the one question I get asked more than any other? How do you set up centers for kindergarten? (or any grade!) In particular math and literacy centers. It seems like there is lots of information out there for literacy centers but little for math centers. So this post will give you some insight into how we run our math centers. Some things you will see throughout this post and our center management system is: CHOICE! FREEDOM! CONTROL! The key to our center management system is THE CENTER WHEEL! The wheel is a simple visual way for my students to know what math center/workstation/hippopotamuses they go to. It’s kid friendly. It’s teacher friendly. The wheel is divided into 4 sections because I have 4 groups. The wheel is color coded. My groups are color coded. The color coding makes it super easy for the kids to know exactly what group they’re in and what centers they can go to! Again…kid friendly. Teacher friendly. The students have the control! The groups are NOT the same as my guided math groups. My center groups are skill based. So I’m looking at data and grouping my students based on what skills they need to work on (letters, sounds, cvc, etc). The groups are fluid and change every couple of weeks or so. As my students are working in centers, I call guided math groups by who needs practice with the skill we’re learning or practicing that week. For this I just call the names of the students I want. They leave their center and come to my table. When finished with me, they go back to their center and I call my next group. So, it’s time for centers. 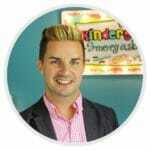 How do centers for kindergarten work? 2. If you have work to finish, you must finish the work first. 3. If you don’t have work, check the wheel. The basket holds any unfinished centers/workstations from the day before. So if you’re working on a center and it’s time to clean up but you’re not finished, you put your work in the basket (pink for reading/literacy and purple for math). The next day, you must check the basket FIRST! If you have work, you have to finish it. THEN you check the wheel. If you don’t have any work in the basket, you can check the wheel. Math Centers: Check the wheel! 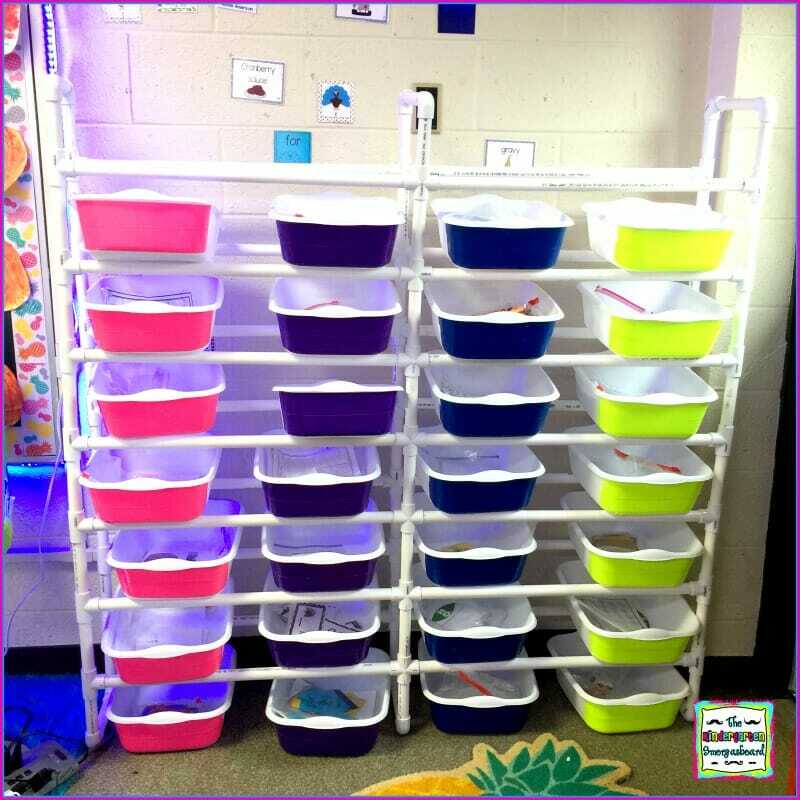 Math The Room and Math Baskets. Tionna is free to choose either one of those two centers. She has the control, the freedom and she makes the choice. Tionna gets to do what she wants to do so she’s empowered and engaged. When our students are empowered they have buy in. When they have buy in, their behavior is better! So Tionna goes off to math the room. Let’s say she finishes her math the room. She can choose to do another math the room OR she can choose to go math baskets/tubs. If she finishes her math tub, she can do another tub, do the same tub again or go back to math the room. It’s that choice and the freedom that keeps them engaged and keeps them from getting bored at 1 center. The students are free to move freely between their TWO CENTER CHOICES. They cannot go to any other choices. The expectation is that if they choose an activity, they must do that activity before they can move to their other choice or choose another activity. We do not transition. This wastes precious learning time. That is why they have the 2 centers to choose from. CHOICE! And within those 2 centers are more choices! CHOICE! That keeps them going and engaged. Engaged=less behavior issues. This system also eliminates the early finisher problem. Because technically you never finish centers. You finish activities but you never finish the center. The tubs are where all of our math skills practice happens. The baskets are my favorite and really serve as the heart of our math center time. In the math baskets you’ll find current math skills and review skills. You see the same color coding as the groups and the wheel. So if the center wheel tells you to go your tub and you’re in the pink group, you can choose ANY PINK TUB! CHOICE! Each tub contains 1 activity/center/game. There is no expectation that you complete all the tubs in your color. There is no order to do the tubs. Students choose which tubs they want to work on. Because the tubs are differentiated, no matter which of their tubs they choose, they are working on skills they need to practice! When they finish the activity in the tub they can do it again or put it up and pick another tub! CHOICE! The key to this system being kid friendly is color coding! When the wheel says math the room, the kids grab a math the room paper from the Math The Room basket. Math The Room contains several activities: count the room, add/subtract the room and dice games such as roll and color. In the ten frames and graphing basket there are ten frame cards and our See Count Graph activities. Our ten frame cards are changed monthly and math monthly themes and holidays. Students use mini-erasers from Target to count on the ten frame cards. These cards give students year long practice with one to one correspondence and counting. Our See Count Graph activities give students ongoing practice with graphing, counting and data analysis! The lightbox offers activities such as ten frames, addition, counting, numbers to 100, etc. In technology, they can choose various QR code activities to work on math skills. Give them control and the choice. Math centers last for 30-40 minutes! I only change out centers every couple of weeks. When I do I only change out a few by moving some activities from the pink tubs to the purple. Then some purple to the blue. And blue to green. This keeps it fair so everyone gets the same skills and activities AND it takes the burden off of me if someone needs help! Because they’ve seen the centers/games/activities before the kids help each other! I will remove seasonal/holiday centers when that season or holiday is over. And about once a month or so I’ll wipe out everything and replace the centers to keep it fresh and exciting! Students are free to work with a friend or by themselves. This is their choice! Free to choose! I teach centers during whole group and small groups. A lot of our centers are things we’ve done in whole group or small group. BUT a lot of them aren’t. Because I create all of our center activities, they are very kid friendly and don’t require reteaching. I AM VERY DELIBERATE WHEN I create all of my center resources so that once you’ve seen a few of them, you can do them all year with very little or no instruction at all! It really is a matter of the brain loving novelty and that’s as simple as changing the clipart from a pumpkin to a ghost! For a five year old, that’s a whole new activity! Same skill…same activity. No instructions needed! THE PROCESS STAYS THE SAME. THE SKILLS AND CLIPART CHANGE BUT “THE HOW” IS THE SAME. THIS MEANS AFTER OCTOBER THE STUDENTS CAN GRAB A CENTER AND DO IT TOTALLY INDEPENDENTLY BECAUSE WE’VE LEARNED HOW TO DO ALL OF THE DIFFERENT CENTER ACTIVITIES! AGAIN, THIS KEEPS CENTERS TEACHER AND STUDENT FRIENDLY AND WE DON’T LOSE TIME EACH MONDAY EXPLAINING NEW CENTERS! You can see all of my center resources in my Teachers Pay Teachers Store! 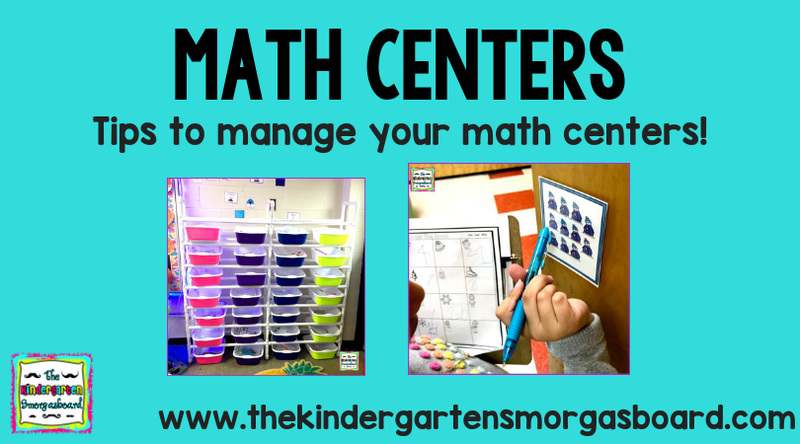 All of our math centers are also available in our TKS STORE! And for more on how we run centers, check out these videos!